Item looks and works as expected. Great size and good overall value. I would recommend to a friend for sure. Country charm with an Easy-going twist characterizes this Cape Cod 6-drawer storage unit from Safavieh. 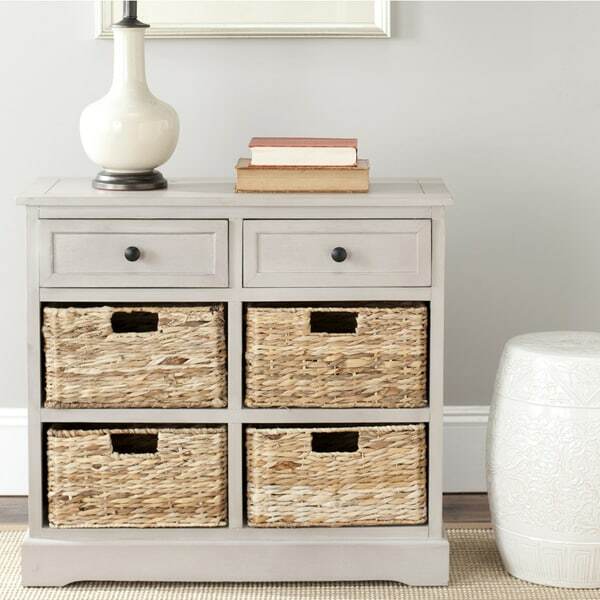 Featuring four wicker baskets, as well as two top drawers, this piece offers ample storage space while providing an additional surface for lamps, books, flowers, or other treasured accessories. Constructed with a sturdy pinewood frame in a versatile grey hue, this storage unit has a contemporary and functional design. The contrast of natural wicker with dark hardware makes this a piece of distinction, adding class and an organic vibe to any decor. Its quaint disposition ensures that it will work equally well in a compact apartment or a spacious family room. This same storage unit in brown can be found at TJ and M but I like the fact that I have it delivered on my door step and with free shipping, it is very convenient when you don't have a SUV. I was looking for a light weight unit with a lot of storage to clear clutter with some style. This storage furniture came already ensembled and as a female I could carry the entire frame into the bedroom. The baskets are nice and the entire color combination is very attractive (light brow baskets/ grey chabby frame). The grey is painted in a distressed way so it gives a little bit more dimension to the appareance. I am pleased with this choice. One of the drawers is not gliding smoothly but it is a minor thing. This is not a high end furniture, but not looking cheapy either...The color choice is a nice change from the regular brown/dark colors you would see out there which would not fit my bedroom theme. A good value! I bought this with the plan to remove the lower two baskets and put shoes on those shelves (this is in my entry). So I was quite disappointed to find that the baskets don't rest on shelves, they are just on runners and you can see through to the floor. Other than that it is a nice piece and I loved that it didn't require any assembly. But if I had known that the baskets didn't rest on actual shelves I probably wouldn't have bought it. Such a cute piece! We bought this to hold all of our 4 year old's shoes in our foyer! Love the 2 drawers at the top which we put all her gloves, scarves, and mittens in! Baskets 'shed' some basket material every once in a while, but that doesn't bother us. What do you want for the money? It's not a super quality piece of furniture by any means.... But I didn't want to spend a whole lot of money for shoe storage, however I wanted something that actually looked nice too! This piece was and is PERFECT for what I wanted! I get lots of compliments on it! No one can believe the price I paid! I'd highly recommend it as long as you know this going in! I love this Cape Cod storage unit by Safavieh. I’m moving into a tiny house and I need storage space and this gives it to me in spades. It is light grey and with the baskets gives me a great look. Thanks. I really like this storage unit. It is put together very well and we didn't have to do anything to assemble this unit. The baskets are really a nice touch and they hold a lot of things. This could work almost anywhere that you need extra storage. We have a small house and we are using this in our living room entry way to hold items that need to be readily available, like car keys and out going mail... gloves, and the baskets can be used to store almost anything like table clothes or kitchen towels, since this is right next to my kitchen. It is a welcome addition to my home. The chest is lightweight and the right size. That is all I can say that is good about it. The right drawer sticks badly, and the drawers do not pull off the track, so I can't fix it. (Another reviewer mentioned this--I should have paid heed.) 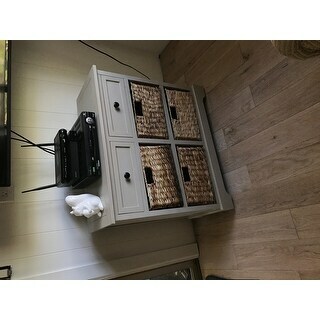 The baskets (which serve as four drawers) are HORRIBLE. They are very rough, made with who-knows-what-type-of-dried-plant, that there's no way anything could be set inside them without a complete liner to protect the item(s). There are big pieces of what looks like dried brush and twigs sticking out everywhere. From a distance, the outside looks rustic. Up close, it's another story. They just look messy. I will have to now spend more money and buy baskets to replace these horrid ones so I can use them as storage. "Live and learn," it's said, and I've now learned to be very careful what I buy from Overstock. Update: I gave this piece away! Money wasted. This was the exact piece I was looking for. It matches perfectly with my bench and I found it here at the best price. One of my pieces came a little damaged but I spoke to customer service and they gave me a little credit for keeping it. My only downside for this piece is the baskets sit on a frame there is no flat surface for them to slide in or out on so sometimes they get caught. I may add a piece of wood so the baskets are able to slide in and out with ease. This low profile piece fits right in with my coastal decor. Great for casual storage. Unit is strong... basket drawers not good for heavy storage but fine for lightweight items. I just love this storage cabinet because it fits perfectly in my guest room and blends in with the overall design of the room. It is sturdy and looks great set before a window . There is just enough extra storage space for my guests! Best of all it required no assembly! Bought for a small apartment and dining area. Wanted a nice piece of furniture plus efficiency. The unit is beautifully made and looks like a buffet instead of a pantry. Love it and it looks so good. Fits perfectly too. Would buy again. Wanted black but it was sold out. This lite grey has black knobs and fills the bill. Perfect for under our wall mounted tv. Works great to hold our blue ray player & cable box. Baskets shed when pulled out but hasn't bothered us yet. Super pretty color! Nice chest for the price. Baskets were not perfect but functional. I love it especially that it came assembled. beautiful storage unit. would recommend it. I love this! Fit into my space perfectly! Love the variety of finishes too. It was a little smaller than I anticipated but it will do. was looking for a storage unit to organize my home gym-would have preferred something a little larger. Great for small spaces. It seems just okay in quality, but looks great and will function well in our place. The color is accurately portrayed online and the drawers slide fairly well. I am pleased with the practicality of this piece but the color was disappointing. It is supposed to be gray. The online pictures are the perfect gray but the reality is more of a khaki. I’m debating about maybe staining it gray myself. Other than the color, it’s great. Beautiful color and sturdy! Even came assembled which was very convenient! Fast delivery!! I’m completely in like with this piece I didn’t have to assemble it! Love Safavieh company such great bang for the buck! If you are looking for great quality and not the high ticket at check out, definitely look into this brand! I really hate that I don't like this but there isn't much to like. The baskets are cheap and upon delivery are already coming apart/shedding (I have other hyacinth baskets in the house and these are a much lower quality). 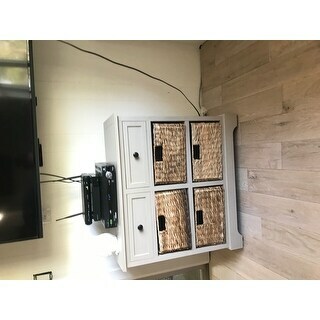 There is a weird stain on the front and a drawer front is chipped - but even without the cosmetic imperfections this is a pretty impractical piece due to no shelves under the baskets. There is no way to 'slide' the baskets in and out - you have to carefully pick up the baskets, make sure it clears all obstacles and slowly pull it out (like the game Operation). I wish I'd not bought it. the color and customer reviews were positive. needed storage for my front entrway for my kids outdoor apparel (gloves, hats, scarves, etc) very cute and attractive looking and great price. "What does the back of this look like? Is it finished like the front or does it have to back up to a wall (unfinished)?" Hello shk910, this item features a finish back as well. Thank you for shopping with us. "are the shelves solid below the baskets ???" Hello glow1313, yes, the shelves are solid. Thanks for shopping with us! according to all the reviews, the baskets do NOT sit on shelves, so which one is it? "could this storage unit be used to store a 2 year olds shoes? about 12 pair? and NOT stacked on top of each other? hard to tell how big this unit is? if baskets are only 4.7" high that sounds extremely small??" Hello carynrdh, we appreciate your inquiry and apologize for the confusion. The overall dimensions for this item are 29" W x 13" D x 27.6"H. Yes, this would work for storing a 2 year old's shoes, as the storage baskets are 13" W x 10.4" D x 4.7"H. This information will be updated accordingly. We hope you have found this information helpful. Thank you for shopping with us. Have great day! "is this accurate that the baskets are only 4.7 inches high? doesn't add up if the total height is 27" high? seems awfully small??" Hello carynrdh, The overall dimensions for this item are 29" W x 13" D x 27.6"H. The storage baskets are 13" W x 10.4" D x 4.7"H. This information will be updated accordingly. Thank you for bringing it to our attention. We hope you have found this information helpful. Thank you for shopping with us. Have great day!